Read more at my passive income blog: Finally Financial Freedom Like what you see? Think you can do better? Sign up for InfoBarrel! So you have decided to start your own web site, but you don't know anything about it. Congratulations, and welcome to the world of website ownership! This guide will help walk you through the basics of starting a site, and what to do next. So relax, and get ready for the joys (and headaches) of owning a site. Head over to WordPress.com, and create an account. Now some site owners will be commenting here that you cannot have affiliate links, advertising, or other key features that will be desirable on the WordPress site, and they are absolutely right. There are other reasons for joining, which we'll get to a bit later, but the most important reason to create a site on WordPress.com is that you can become familiar with the editor and dashboard, without jeopardizing your own site and messing up something that you care about. Creating a page or post is simple. So take a few minutes, set up your website there, and make a few posts. You don't even need to publish them; you can simply save them to drafts. Once you are comfortable with the editor, spend a few minutes to create a page or two, and again, you don't have to publish. Think of this as a sandbox to play around with. Save your text as a draft, play around with the visibility, or publish. Try scheduling your publish date in the future, or even in the past! Now that you have a few posts or pages, it's time to see how you can change up the look of your site. If you go to Appearance, you can play around the with look and layout of your new website. Change your theme, add and remove items, change your layout, and more. This is your playground to become comfortable with the different options in WordPress! Okay, I Feel Confident, Now What? Once you feel confident that you understand the basic features of WordPress, you will have to do a bit of research. What you want is a self-hosted site, which means finding web hosting and paying for a domain name. There are many web hosting services out there, ranging from free to expensive, and each has benefits and drawbacks. The most important thing to remember is that you do not want a "website builder," but a "self-hosted WordPress" site, so factor that in to your research. If a provider wants to charge you more than a few dollars a month for hosting, go elsewhere. Even hosting unlimited sites can be found for $10 per month. Most hosts have a fairly simple WordPress install, and most of them will have pre-written instructions on how to install it, because this is one of the most common requests. Don't be afraid to ask for help, because you're not alone if you're confused. 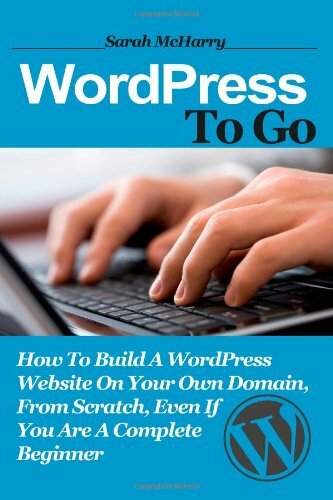 There are hundreds of web sites with instructions, help chats, forums, and even YouTube videos showing you step by step how to do your WordPress install on whatever host you choose. Choose your domain name carefully; this is a step that may take you several days or weeks (my own took well over two years to choose). There are many places that sell domain name registrations; you don't have to go with GoDaddy, but for the first time, choose one with some support. First-time registrations should cost no more than $10 for the first year; if you find higher prices, keep looking. When the time comes to renew your registration, go with the cheapest provider you can find that offers a bit of help in pointing your name to your site. After that, if you've taken careful note of the instructions, you can go with the cheapest registrar. Do you want comments? If not (many times you won't), turn them off. Before you post your first page or article, turn off comments entirely. Do yourself a favor; even large, reputable sites have begun to disable comments. Under Users in the WordPress dashboard, make your public display name different from your username. This will defeat a lot of casual hackers. Make sure "Display name publicly as" is different from your "Username"! There are thousands of free themes to choose from, once you have WordPress installed correctly. With the trend towards accessing sites from mobile devices, it's best to choose a theme that is "responsive." Flat design is the new trend, so search for some web sites that show off the best designs of the year, and find a theme that fits that aesthetic. Yes, you can pay for a theme, but are you going to get any real benefits from the added expense? What is a WordPress plugin? It's simply a bit of code that adds extra functions to your site. JetPack for WordPress gives you many options to extend the functionality of your site. You have to have a WordPress.com account to activate this, so now aren't you glad you created that account? Activate only those features you are actually going to use, such as site stats. Akeeba Backup for WordPress. Running a backup on a regular basis is crucial in case the worst happens. Broken Link Checker will check for any broken links, and suggest replacements from the Internet Archive if a page has been taken down. Don't keep it active all the time; I usually activate it once a month to check for broken links, fix them, deactivate the plugin, and then run my backup. Optimize Database After Deleting Revisions will specify how many revisions you can keep to back up your work, and then delete the extras, and optimize your WordPress database, considerably speeding up your site. Add Meta Tags also does schema.org and microdata, which is useful for search engines and gives your site better visibility. dpabottomofpostpage allows you to display copyright notices, calls to action, affiliate links, or your own advertisements at the bottom of each page or post. Google Analytics Adder adds analytics to your site. Google XML sitemap is again, a tool mostly for search engines, but can also help your users find exactly what they are looking for. Wordfence Security will protect your site from hackers, and provide caching to allow your site to load faster, too. List All URLS does exactly that. Organize Series allows you to easily publish posts that are intended to be read in a particular order. For one or two posts in a series it's probably not useful, but if you're planning many series, it's invaluable. Yet Another Related Posts Plugin shows related posts at the bottom of each of your posts. Post Tags and Categories for Pages allows you to add tags and categories to pages. This is useful for sites with dozens of pages, but not necessary if you have only a handful of pages. If you want to sell products on your site, you can use the WooCommerce plugin, which works very well with almost all themes and plugins. One thing to remember about plugins is to "try before you buy," and to make sure the plugin you want has been updated recently and is compatible with the latest version of WordPress. Unless you really love the song, you can deactivate the included "Hello, Dolly" plugin. It doesn't add any extra functionality to the site. Once you have deactivated it, you can delete it. Tweak something on the appearance of my site: See if there's a setting for it under your theme options. If not, you'll have to go into the CSS of your site (Appearance > Editor) and change the code. Don't do this if you don't know what you are doing, unless you make a backup of your site, first! Of course, you can always try things out on your WordPress.com site. Get my site to do something you haven't covered: Search for a plugin that does it, first. There are many sites devoted to WordPress that will review plugins, or even give you code to do the function without the plugin. It's simply not possible in one article (or one book, or even a whole library) to cover everything! Good helpful information. I was surprised that you say no comments. I thought this encouraged people to come back. And more interaction. Thanks for good information. Sometimes all you get in comments is spam. For new sites, that's probably all you are going to get. Akismet is useful for that. In more than ten thousand comments made on my site, only eight were not spam. Wow that is incredible. Thanks for that wake up. As mentioned in the article, make sure that you enable backups. Using the Akeeba plugin is a great idea. I am a complete troglodyte when it comes to tech. Thanks for this article. I'm sure I will be referencing it often. How would I move articles back and forth between IB and my new blog? Go into Edit Mode (if you want to save formatting, links, etc.) just as if you were going to edit your IB article. Select everything in each element and copy it into the WordPress editor (don't forget to save!). Then delete your original article on IB and publish it on WordPress. The editors are similar (although the icons look a bit different. Just remember that WordPress doesn't have individual elements, so you'll have to move text around with cut and paste. IB doesn't let you have the same content on their site and on your blog, too. Instead of moving, I'd rewrite and reference the other article.